02:43 — Rentaghost: WB working on a film version. 03:36 — Doctor Who: On BBC Radio 4’s Thinking Allowed. 04:21 — Torchwood: Two new major casting announcements. 05:23 — Stargate Universe: Dead. 08:46 – Festive Game: Doctor Who Top Trumps. 20:08 – BBC Four’s Dirk Gently. 27:13 – Festive Game: Swanee-Kazoo. 34:18 – Quiz: Name that Doctor Who character and story. 83:53 – Farewell for this podcast! 76:57 — End theme, disclaimer, copyright, etc. It’s Christmas! A special time for little Daleks everywhere. To celebrate this we proudly present a new Mr Dalek Audio Adventure on our podcast feed. 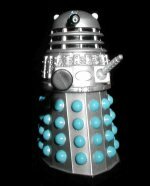 This exciting story, new to audio, is written by long time Mr Dalek fan, Benjamin F Elliott, and narrated by Tony Gallichan. So , prime your sucker arm for Mr Dalek and the Amiable Assassin! Adam J Purcell, Andy Simpkins and Keith Dunn sit down, stupified, in front of the 1979 Doctor Who story, The Horns of Nimon, and spout our usual nonsense! See if you can spot the points where we each lose the will to live! 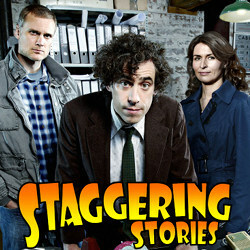 Staggering Stories Podcast #95: Merlin – Dead! 03:02 — Doctor Who: Christmas Special transmission time for UK and Australia! 04:30 — K9 Series: UK Channel Five start date and time. 05:23 — Doctor Who: Fourth Adventure Game on Christmas Day and mobile phone game coming soon. 08:04 — Dead: Ingrid Pitt, Leslie Nielsen and Irvin Kershner. 10:36 — Doctor Who: New Amy Pond figure coming. 12:02 — Tron: Crumbly’s still pushing the Tron Legacy film. 13:58 – Doctor Who: ‘Series 5’ DVD/Blu-ray Boxset. 24:00 – Merlin: Season three retrospective. 40:40 – Harry Potter: The Deathly Hallows, Part One. 75:55 – Farewell for this podcast! Welcome to the seventh Doctor Who Podcast Alliance joint podcast. This episode was recorded both at and a little after the Chicago TARDIS 2010 convention. It is hosted by Steven Schapansky of Radio Free Skaro who holds a post-con discussion with Ken Deep of Doctor Who: Podshock. Phillip Serna from the Doctor Who: Adventures in Time, Space and Music Podcast kindly put a lot of work into getting interviews at the event, with Nick Briggs, Rob Shearman, Simon Guerrier and Toby Hadoke. If that is not enough, you will also hear some select audio clips from the podcast panel! 01:14 – Post convention discussion between Steven Schapansky and Ken Deep.